Established in 1980, here at Gilvar Lining Ltd, we have a wealth of experience in our specialist field. Providing an exceptional service, our road marking solutions are second to none. Established in 1980, Gilvar Lining Ltd are specialist road marking contractors in Staffordshire covering a 100 mile radius from our base in Burton-on-Trent. 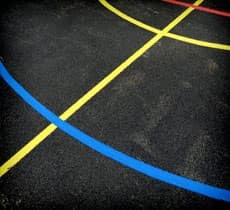 For the past few decades, we have been providing our customers with quality road marking services, specialising in all aspects of painted line markings for car parks, sports courts and factory floors. 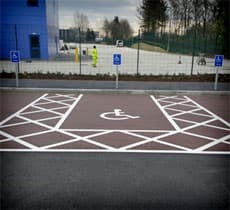 Whatever the size or the scale of your project, we can offer you work of the highest quality with all markings painted expertly, and work carried out in a professional manner to superior standards, within the timescale agreed. 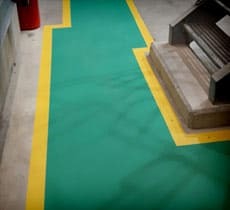 Working as a specialist contractor for road markings, car park marking and internal floor markings, we offer the full complement of solutions, with free quotations available and work completed by a highly qualified team. With nearly four decades of experience in the industry for site safety markings, our expert workforce can apply road markings for an array of environments and applications, working to safe industry standards and using effective and dependable processes at all times. We have helped many businesses over the years and worked with countless companies creating markings across many different sites. Our markings are suitable for a variety of functions, from traffic management to pedestrian walkways, transforming roads and pavements to aid traffic control, making spaces safer on a host of sites. 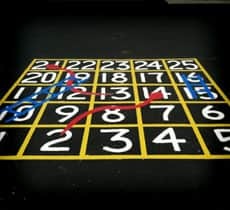 At Gilvar, we can apply white and yellow lane factory floor markings, traffic markings, and a host of marking solutions for car parks, play areas, sports centres and warehouses. Whatever the requirement, we always operate with professionalism and enthusiasm, and help you maximise the potential of your site. We will beat any quote for line marking services in Staffordshire and handle larger contracts as well as smaller private work. Simply send us your enquiry to find out more about our road marking services and get a free quote today. 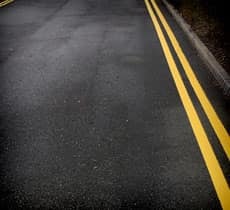 Working as one of the longest-established road marking contractors in Staffordshire, we take the greatest pride in the high level of customer satisfaction our clients’ experience. Having established an extensive client base, over the years we have worked with a variety of customers in numerous sectors, including councils, factories, retail shops, schools and the sporting sector. All of our road marking solutions are specifically tailored to the exact needs of our customers, and you can find out more about them by contacting us today. Please feel free to contact us to see how our friendly road marking contractors can be of service to you. You can call us on 01283 712 450, or fill out our online contact form and a member of our team will be in touch to handle your enquiry. We pride ourselves on the high level of customer satisfaction our customers experience. With an extensive client base. Over the years we have worked with a variety of customers in a range of sectors including; councils, factories, retail shops, schools and sports centres providing a wide range of road marking solutions, specifically tailored to suit the needs of our customers. Feel free to contact our friendly road marking contractors and we will be happy to assist you. You can call us on 01283 712 450, or fill out our online contact form and a member of the team will be in touch.